From Starbucks on the corner of Connecticut & R N.W. We’re trying out a different Starbucks today. Like many major cities in the world, there is a Starbucks almost on every corner in this part of the city. We thought – since the weather was so good – that we’d venture just a bit further up Connecticut. It’s amazing what a couple of blocks will do either way. 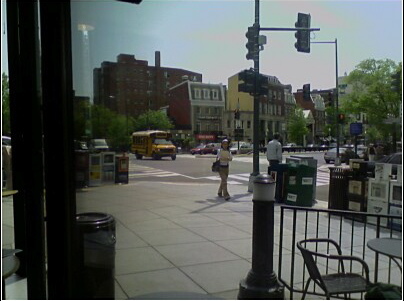 If I leave my office and walk down Connecticut just a block or two we are in the spill-over of the K Street Corridor. Heading up this way is an entire different group and virtually no hint of the K Street Corridor at all. I’m not sure who al these people are – Tourists? Students? Stray Protestors? Scientoligists? (their HQ is just just across the street from here in a spooky brick fortress near Cosi’s). There are businessmen every where – but they look decidedly different from the K Street Lobbyists that stalk about Connecticut and K. Wow, there’s a guy looking like Jerry Garcia and he’s carrying on quite a conversation with himself. Oh, wait, he’s got a bluetooth thingy in his ear. There is always a thin line between the K Street Lobbyists and the Street People. The crossroads is the fountain at Dupont Circle. One never knows what some of these Street People were doing six months ago. Does this mean that my Sewickley office is currently vacated? These people whom you were unaware are predominately your homosexual brothers and sisters. Funny, how we just blend in as people when you’re not trying to throw us out of the Church. Anon:Does that include the skins with the white laces? Careful, sometimes you might think you know what you are talking about only to learn that the history & make up might be different that <>you<> suppose.